With six of the eight Quarter Finalists set at the US$100,000 Argo Group Gold Cup, the penultimate event of the 2015 World Match Racing Tour, all eyes are on the Repechage to see which two crews will join the action slated for Saturday. At the end of today Chris Steele’s 36 Below Racing from New Zealand and Keith Swinton’s Black Swan Racing from Australia have the edge. They’re each at 2-0 with two of seven scheduled flights completed. “Today was more tactful, with the wind lighter than yesterday,” said Steele, who’s competing at the Argo Group Gold Cup for the second time. Steele sees his place in the repechage as somewhat unlucky, given that he lost three races in which he had control But he was undone by penalties in each instance. Besides Steele and Swinton the Repechage also includes two America’s Cup teams, Dean Barker’s SoftBank Team Japan and Francesco Bruni’s Artemis Racing, World Match Racing Tour regular Johnie Berntsson’s racing team (the event’s reigning champion from Sweden), Blythe Walker’s Team RenRe from Bermuda, and two other younger teams – Chris Poole’s Riptide Racing from the USA and Reuben Corbett’s racing team from New Zealand. Six teams have already qualified for the Quarter Finals, based on finishing in the top three in their respective groups in Qualifying. 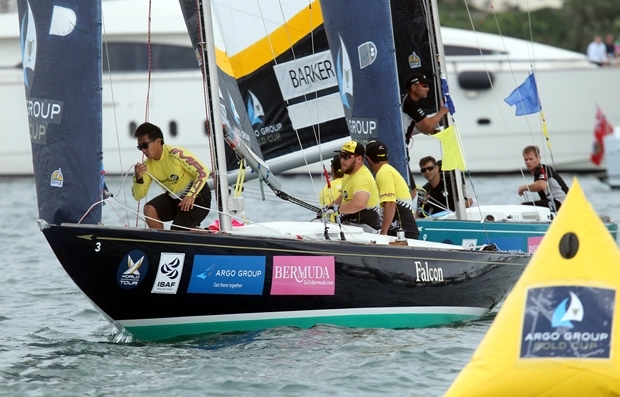 The teams from Group 1 include Phil Robertson’s WAKA Racing, Eric Monnin’s Team SailBox and Ian Williams’ GAC Pindar. Robertson has previously finished fourth in 2011. Today he and his crew went 3-0 to overtake Monnin for the group win. He called the Argo Group Gold Cup the hardest event he’s sailed this year. The teams from Group 2 are Taylor Canfield’s US One, Björn Hansen’s Nautiska Racing and Adam Minoprio’s BlackMatch. Repechage will resume tomorrow morning at 0900hrs (ADT). Stay up to date with the event as we bring live race action via Twitter on @wmrt_liverace and regular updates on @worldmrt from Bermuda. Follow us on facebook.com/worldmatchracingtour to get the latest news, event updates, behind the scenes and information of the Argo Group Gold Cup.